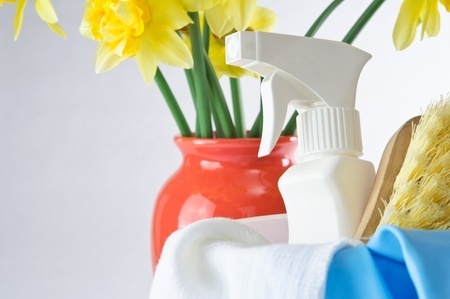 With all the cleaning products, storage solutions and time spent scrubbing, spring cleaning can seem like a costly process. Thankfully, there are several ways to cut your costs. In various ratios and with a few optional extras, the simple combination of distilled white vinegar and water can replace several key household cleaning products. While the vinegar scent disappears quite quickly, if you're sceptical, you can just add a few drops of lemon juice to your mixture. For an all-purpose cleaner, combine equal parts vinegar and water. For glass/mirror cleaner, combine one part vinegar with three parts warm water. And for a slightly stronger mix for your tiles and countertops, you can mix two parts vinegar, one part baking soda and four parts water. Remember that the mixture can be (carefully) adjusted to suit your own surfaces - you don't get that kind of flexibility with off-the-shelf brands. It's not just what you wipe on your surfaces that washes away your savings, it's what you're using to wipe. Disposable paper towels, kitchen roll and antibacterial wipes are a costly luxury than can be easily replaced by reusable cloths. Better still, if you're clearing out your wardrobe or your linen drawer, your old items can be cut down into a collection of cleaning cloths. Light, fluffy fabrics are great for dusting, absorbent ones are perfect for polishing glass or tiles, and tough cottons and linens work well on kitchen surfaces. Unblocking a drain is one of the messiest of spring cleaning tasks, and supermarket products are often expensive and inefficient. Fortunately, there are a couple of quick tricks you can create at home. The easiest is to simply pour half a cup of baking soda down the plug, then follow it with half a cup of vinegar, let it fizz, then flush with hot water. If that doesn't work, try caustic soda: it's much cheaper and more effective than most big name brands. One of the big trends over the last few years has seen people copying their music onto hard drives and selling the hard copies online via auction sites or buyers like Music Magpie and Zapper to recoup their cash. But what can you do with your old CD rack? Lots of things, it seems. Giddy upcycled suggest attaching it to your bathroom wall, back facing downward, as a bathroom organised for all of your products. But you could also give it a coat of paint and use it as a shelf for plants or, if yours is past its best, it can work just as well for separating your cleaning products under the sink. If you manage to make your own cleaning products and upcycle throughout the year, you'll find you can save a significant amount of money. To keep track of just how much you save, try our free Money Dashboard budgeting software, which collates and tags all of your income and outgoings in one simple space.